President Barack Obama pauses as he speaks about the situation in Ferguson, Mo., Thursday, Aug. 14, 2014, in Edgartown, Mass., during his family vacation on the island of Martha's Vineyard. Photo Credit: The Associated Press, Jacquelyn Martin. When it comes to issues involving race, President Obama walks a fine line as the first African-American president of the United States. It was again evident when he avoided mentioning race as he reminded us that we are all a part of one American family in his statement following the death of Michael Brown, an unarmed black teen, at the hands of a police officer in Ferguson Missouri. For President Barack Obama, the intersection of race and the law has revealed both the pitfalls and the power of wading into these delicate matters as the nation's first black president. Just months after being sworn in, Obama rapped police in Massachusetts for acting "stupidly" by arresting a black Harvard professor at his own home. After more details of the case were revealed, Obama clarified his statements and tried to make amends by hosting an awkward "beer summit" at the White House with the professor and police officer. Four years later, unburdened by re-election, Obama spoke out passionately about the 2013 acquittal of the man who fatally shot Trayvon Martin, an unarmed teen gunned down near his family's home in Florida. In unusually personal terms, Obama declared that Martin "could have been me 35 years ago" and gave voice to the pain felt by the African-American community. In his first in-person statement on the situation, Obama appealed Thursday for "peace and calm" in Ferguson and called for restraint by all involved. "There is never an excuse for violence against police or for those who would use this tragedy as a cover for vandalism or looting," Obama said, speaking from the Massachusetts island of Martha's Vineyard where he is in the midst of a two-week vacation. "There's also no excuse for police to use excessive force against peaceful protests or to throw protesters in jail for lawfully exercising their First Amendment." There are conflicting reports about what led to Brown's death. Police say that an officer encountered Brown and another man on the street, and one of the men assaulted the officer and struggled with him over his weapon. During the struggle, which spilled onto the street, Brown was shot multiple times, according to police. But a man who says he was with Brown during the shooting has told a much different account. Dorian Johnson says the officer grabbed his friend's neck, then tried to pull him into the car before brandishing his weapon and firing. Johnson and another witness both say Brown was on the street with his hands raised when the officer fired at him repeatedly. Obama's carefully worded statement reflected the lack of clarity about what happened. He urged police to be "open and transparent" as the investigation unfolds, but made no judgments about what led to Brown's death. Obama avoided mentioning race in his statement, and he called on people to "remember that we're all part of one American family." The president's approach stood in contrast to his initial handling of the 2009 arrest of his friend Harvard Professor Henry Louis Gates. Obama declared during a White House news conference that a white police officer had acted "stupidly" in arresting Gates outside his home. Obama conceded days later that his own remarks had inflamed the situation and that Gates had probably overreacted in the moment, contributing to his arrest. The incident was a searing one for a new president and his team, trying to navigate a black president's role in sensitive racial matters. Throughout the remainder of his first term, Obama largely steered clear of controversial discussions of race, at times irking African-American leaders who wanted to see him take a more active role in racial issues. But the president's reserve did memorably give way when discussing the death of Martin, an unarmed 17-year-old killed near his family's Florida home by a neighborhood watch volunteer. 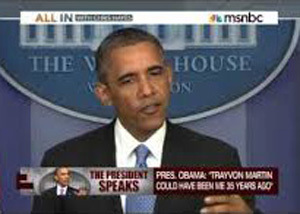 Obama addressed the matter in unusually personal terms, declaring that if he had a son, "he would look like Trayvon." A year later, when the man who shot Martin was acquitted, the president again used deeply personal language to try to explain the outrage of many in the African-American community. "The African-American community is looking at this issue through a set of experiences and a history that doesn't go away," Obama said, recalling instances where he had been followed in a department store or heard car locks clicking on doors as he walked down the street. Obama made no such statements Thursday when discussing Brown, saying only that the teen died in "heartbreaking and tragic circumstances." "The president as the chief executive has to be careful and thoughtful in his choice of words, particularly at a moment when there's unrest - unrest in the streets, but also unrest in the American conscience," Brooks said.